Stem water potential is a reading of what is going on within the xylem of the plant. 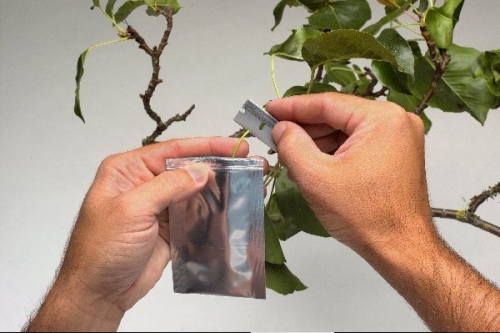 To take this reading a reflective plastic bag is placed on a lower canopy, shaded leaf, and the bag is left on long enough (as little as 10 minutes may be sufficient) to allow the water tension in the leaf to come to equilibrium with the water tension in the stem or trunk of the plant. 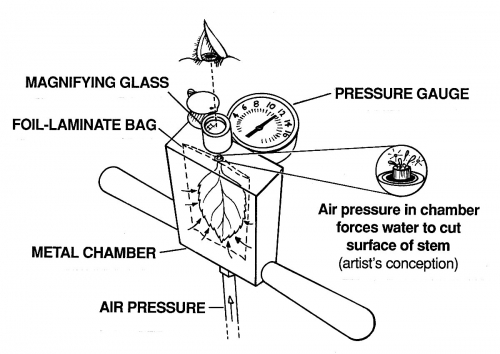 The leaf is removed from the plant and tested in the pressure chamber while still enclosed by the bag. For more information about Stem Water Potential click here. 1. Cut a leaf from plant to be tested. Use a sharp blade to make a clean cut. Avoid breaking the sample. 2. 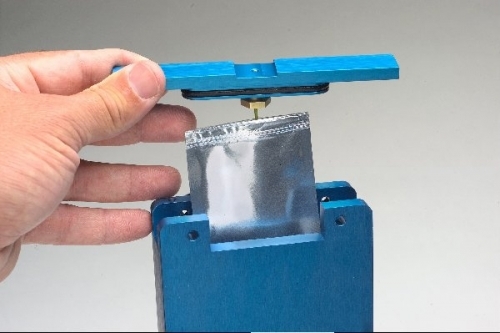 Insert the leaf into the hole in the lid so that the end of the sample barely protrudes through the lid. Twist the Compression Screw clock-wise to seal the sample. 3. Put leaf inside chamber and lock down the lid into chamber. Place pins completely through holes so they are locked. 4. Ensure you are wearing eye protection in case sample slips out of chamber. 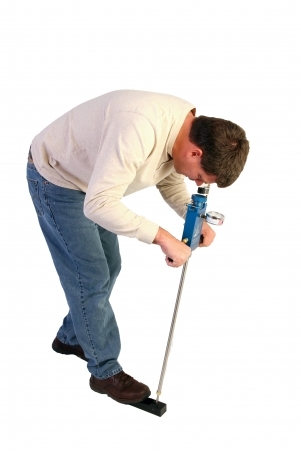 Place foot on foot-rest, swing eye lens in place and begin pumping instrument. 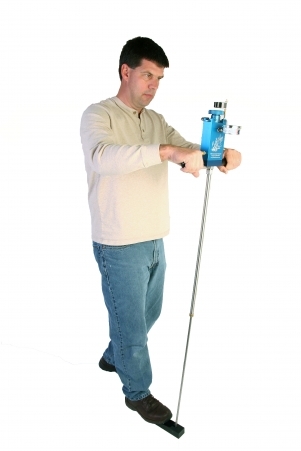 Instrument should increase pressure about 1/2 bar per stroke. If instrument does not increase pressure, check sample seal and also check for obstructions between chamber lid O-ring and chamber wall. 5. While pumping on the down stroke watch sample through eye lens for a film of water to appear. When water appears, stop pumping and record pressure indicated on gauge. 6. Use Pressure Relief Valve to release the pressure completely, remove pins and lid and you are now ready to measure another sample. the Chamber lid. 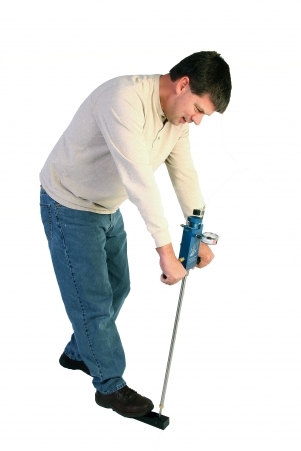 Failure to do this could cause injury. Always wear eye protection when using the instrument!